As close to a rockstar moment as I’ve had recently would certainly be the invitation to set foot in this kitchen (though let’s be fair, the invitation was owing to Doug’s reputation, and my lovely wife and I just got to go along for the ride). If you’re not a foodie or fan of Anthony Bourdain, it might not register just what an honor this photo op was, but indulge me the explanation that follows. 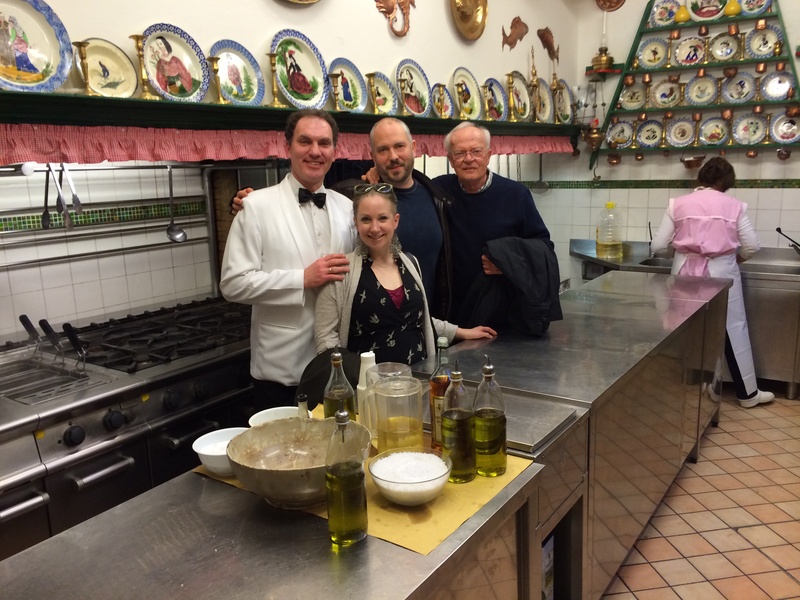 This is one of the most important kitchens in Europe for good reason, and we got to stand there. Some folks’ knees knock together and their hearts race when they meet their favorite actor or musician; mine do that when I get to set foot in a famous kitchen where greatness happens, and needless to say I was having one of those joyous moments! Trattoria da Romano is another prime example (Mama Isa’s kitchen being another we’ve touched upon recently) of the Italian culinary traditions that do not just deserve preservation but rather require it for Italy to remain true to herself; Sassi Italy Tours has been dining here and taking clients here for more than 20 years, and it is no accident that Doug gets the velvet glove treatment here—the fine folks who have kept da Romano thriving for four generations and counting are gracious hosts, and are truly, openly, and to the bottom of their hearts grateful for guests who genuinely take an interest in their traditional methodologies, recipes, and tenacious attachment to doing things the “old way” not merely as a gimmick but as embodiment of pursuing culinary passion. In short, they still do it the way Venetian fisherman and residents did it a century ago, and they are onto something not to be missed. 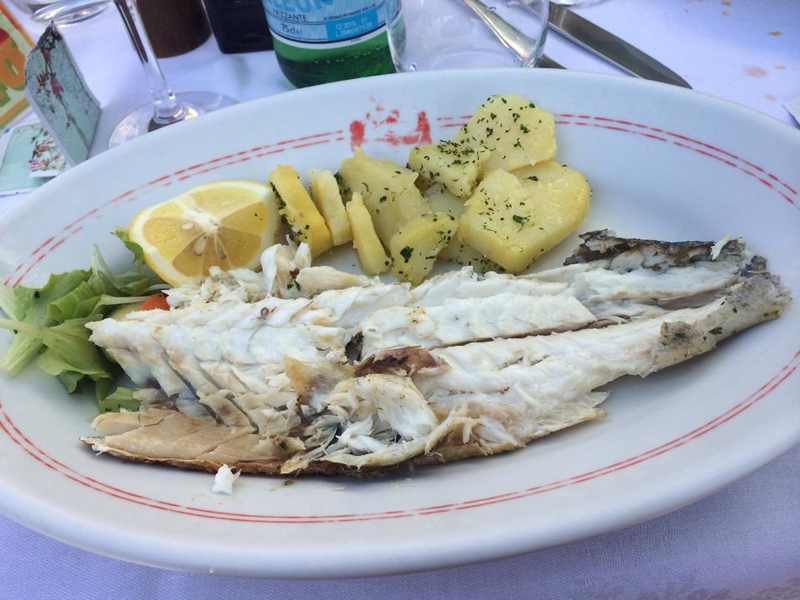 After a walk around Mazzorbo and then the lace making shops full of le nonne tatting together luxurious pieces of lace finery that make Burano, well…Burano, it was time to munch. Heading to our favorite spot, I reflected upon few years ago when Tony Bourdain did his Venice episode (click here if you missed it–Massimo and other our other favorite waiters are featured prominently, and it’s great to see these guys year after year as they’re not only friends, but consummate professionals who treat presentation and preparation like the art that it is) feeling almost violated; that was *our* “secret spot” he was telling the world about, a spot Doug had discovered while Tony was still sous-cheffing his way through NYC’s infamously treacherous restaurant scene, easily a decade or more before he was anything approaching a celebrity. His good word was going to land cruise ships full of us tourists on Burano’s vaporetto stops clogging up our favorite restaurant…but a humbling, food-snobbery eliminating realization struck me: Venice and Italy generally cannot sustain their food traditions merely on the strength of foodie Italophiles and art history guides. They need travelers to find the authentic goodness, the rustic charm, and the classical recipes in their native environments to sustain what is the original slow-food locavore movement. This isn’t lost in the slightest on Gigi (proprietor and fourth generation in his family to run Trattoria da Romano), and as he opened a bottle of brolettino for us and engaged us in conversation (this itself was no small honor, to have the proprietor of one of the most important restaurants in Italy opening our wine for us) he made a point of saying that he still appreciated Anthony Bourdain’s feature on their restaurant and how it helped bring international attention to their efforts to preserve traditional Veneto cuisine. It’s no small thing, and while I’m sure there was never any doubt, Tony, rest assured you are still very much appreciated on Burano. They’re grateful, and so am I that this little corner of foodie heaven got the exposure it deserves. After a ridiculously amazing meal of local mussels and clams, their famous risotto, and branzino grilled over a woodfire with garlic, local olive oil, and lemon, it was time to hunt down some gelato and grappa before shooting some more Burano shots (every ten paces on that little island is another breathtaking photo op, no exaggeration), but not before Massimo invited us to take a pic with him in this mecca of food. 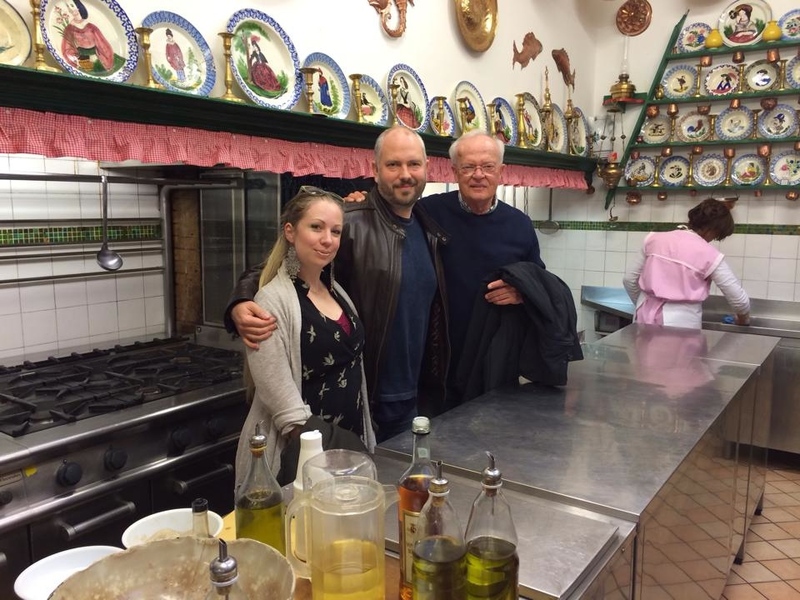 Sassi Italy Tours takes clients there a lot, but it’ll never, ever, ever get old, and to Massimo and Gigi, we can’t wait to dine with you again. Ci vediamo a presto!